I took this the other morning on my way to work. 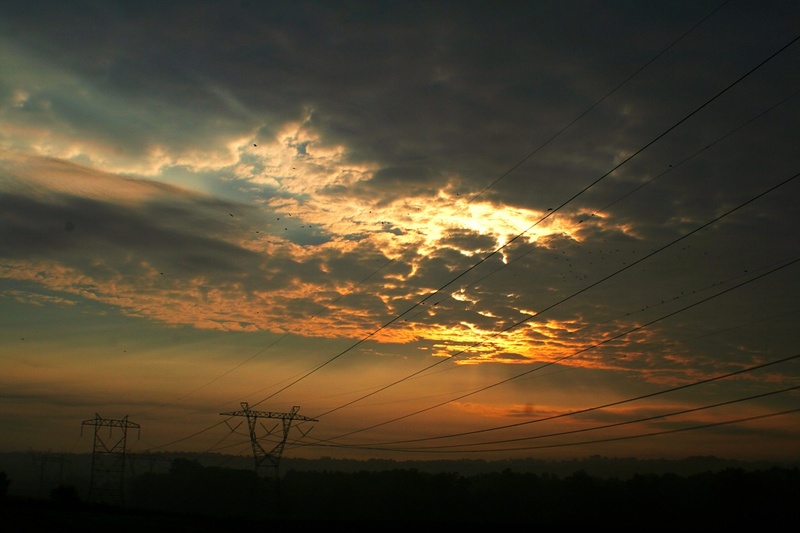 The electric wires serve as a good subject for our theme,and of course the sunrise adds so much more to the photo. Thank you all for your well wishes following my knee surgery. In the past 12 years I had three meniscus tears on my left knee, requiring surgery, and now the next time my left knee goes bad, I was told it will mean a total knee replacement. This was the first meniscus tear on my right knee, hopefully it will not follow the same pattern as my left one. All my previous knee surgeries went very well, no need for pain meds and I was back to work after the 2nd or 3rd day. This time it doesn't seem to be as pain free as before, but I've been able to manage it fairly well with some minor pain meds. Tomorrow I take off the wrap and pick up the pace a bit more, go out for a walk, and see how it goes. I am not one to be sitting around. Next week I must see my cardiologist, and get the all clear, hopefully. Love the colors in the sky and the theme connection. I'm so glad that things went so well with your knee! and hopefully it doesn't follow the same path! Nice colors. Good luck with the knee. Stunning....It's electrifying in so many ways! Rest up....! beautiful shot Rick- hope you are feeling well!! Gorgeous sunrise Rick. Like this new day, I hope all looks bright for a full recovery. Glad to read you can get out for a walk. I find that time so gratifying, and feel all the better for having done so. Wishing you the same! love th colors in the sky....take care of yourself! this is such a stunning sunrise shot, rick. This is such a striking photo! I think the telephone wires actually add to the shot. usually I try to avoid them, or delete them, but the effect here wouldn't be the same without them. Great capture! Keep taking it easy! Terrific shot. Very pretty. I hope the knee pain subsides, and all goes well with the cardiologist. This is a GREAT shot!!!! I always think that I have to have a clear view of the sky but the electric lines are perfect. Theme? I am fairly new to this site. Is there always a theme? The power lines really add a lot to this shot, but the sunrise would be stunning on its own. The lines of the electrical power wires are truly enhanced against nature's powerful beauty. I am glad to hear that your knee surgery recovery has gotten off to a good start. Hope it goes as well with the cardiologist -- but I was surprised to read this specialist; as I was expecting that you needed an "all clear" from the orthopedic MD. So beautiful...guess I need to get up earlier :-) Hope the knee recovers quickly. Rick - another amazing photo! The sky is so dramatic, and rich with colors! And, I do love the power lines :-) Great one for the theme! Great timing for your photo. It's terrific! Beautiful shot, and I hope your knee continues to improve! Beautiful picture, including the telephone lines. Wishing you an uncomplicated recovery. Hope the cardiologist has good things to say. hope your knee continues to improve ! Hope you're feeling much better. Rick. As the sunrise suggest, it's another day we wake up to & life is such a wonderful gift from God. Nice capture! I'm so happy that your knees are doing okay. Sounds like you've been through a lot of trouble, but they are getting better right? I hope you get the all clear too. I am not one to sit around all day either so I know how you feel. Beautiful sunrise. I like the electrical lines silhouette amid the colors. Very nice. Glad you are on the road to recovery. Best wishes for continued improvement. Ordinarily telegraph lines would spoil such a wonderful sky, but because of the perspective and the way the lines take you from the corner to the centre - they become very much a part of the picture - and of course fit the theme perfectly! Beautiful shot. Sorry to hear this knee surgery has not gone as well as the last. Take those meds and keep pain free, it will help you with your rehab! Great composition. It does look electrified and beautiful. Hope you get well soon. Totally beautiful. I hope you'll be off the pain meds soon, good luck with the cardio tests. Love this picture Rick..........hope you are feeling better soon! Will I see you tomorrow at work? It's great! I love the name you chose for it. I hope you heal quickly. What a great view!! Love the orange in the sky! Such a dramatic sunrise, I love it!!! very great rick! love the sun here! I love being up early enough for a sunrise picture. It's lovely. Wow! This is breathtakingly beautiful! gorgeous sky:). nice capture Rick:)! Gorgeous colors and cloud formation. Good luck with your knees. It is a fantastic capture, great lighting!